How Is this done? Organic Settings? 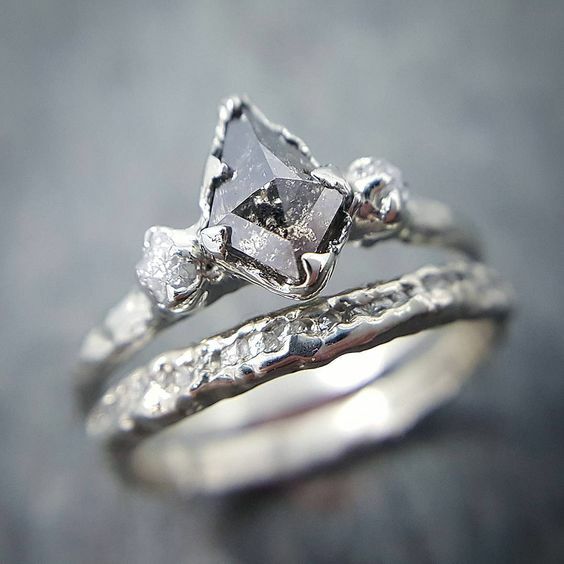 Can anyone enlighten me on how this type of ring is done? I love this style and would really like to try and do a few. Is the wax carved around the stone and then cast with the stone as part of the mold in the flask and the metal forms around it? 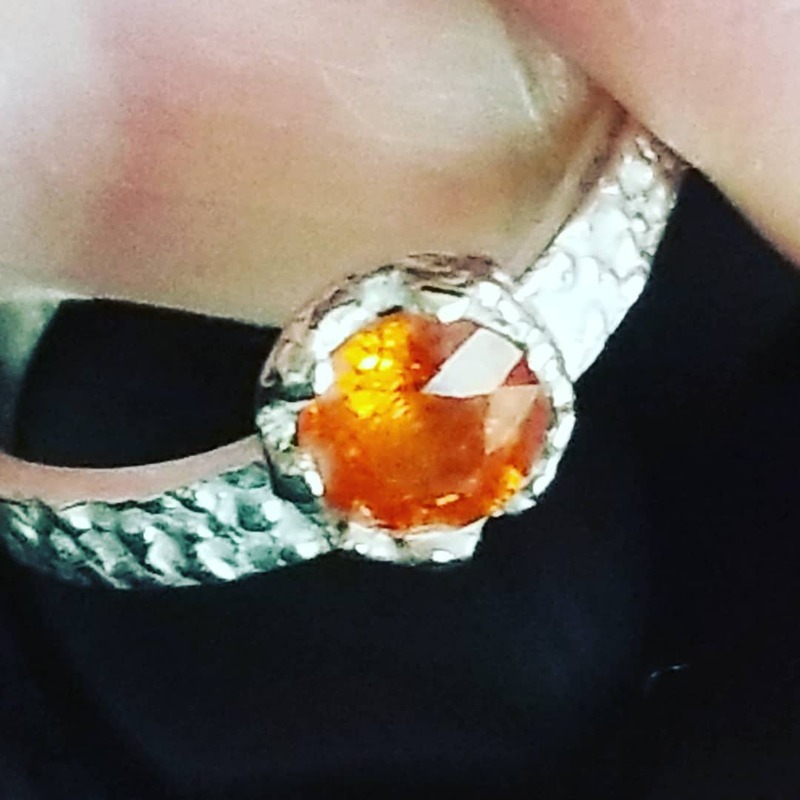 If so, how does the temperature of the metal affect the stone? Is the wax carved around the stone and then somehow removed and the wax is then cast? Or Something else that I just can’t figure out? Saw this on pinterest. Kudos to whoever made it. It is just so organic, it does not look hand carved. It is made by electroposition. You do all the work with epoxy, then you use a conductive enamel, then you put everything in the voltage rectifier in a solution of silver, gold or copper. that is a diamond. Enough heat and it would burn up because it is carbon. You asked how the temp of the metal affects the stone. The stones would be set afterwards I believe. 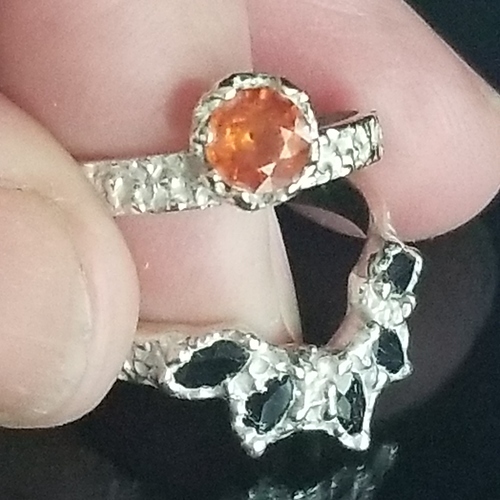 This ring looks like a standard bezel set. The ring had a nice contemporary organic look for sure. Personally, I suspect it was cast in place. That would require the diamond be without serious defects. 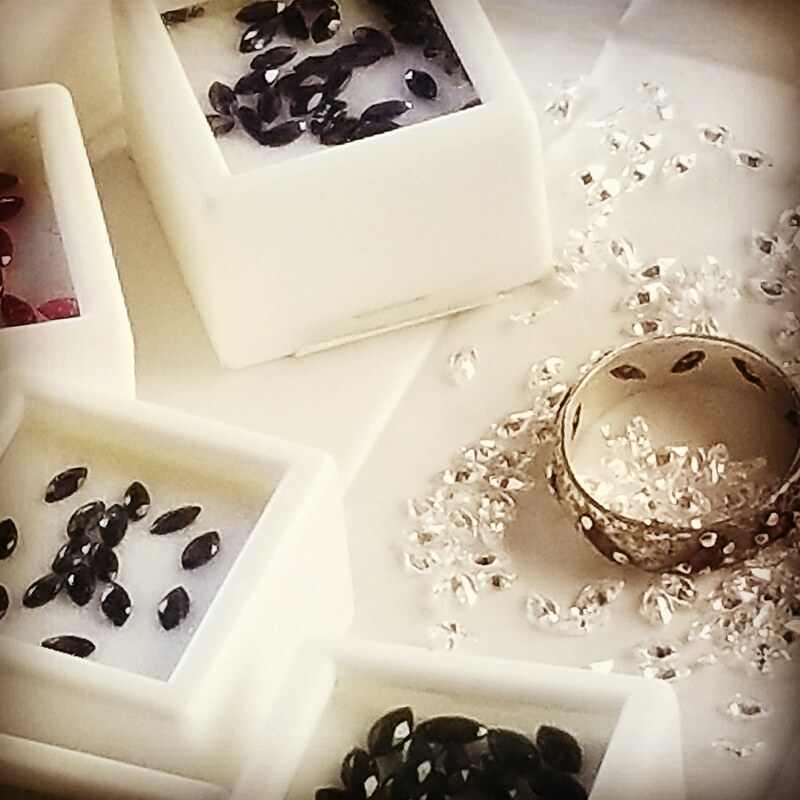 Casting gemstones in place works well with white diamonds, rubies, blue sapphires and CZs. The burnouts are the key. Slow and low and absolutely no quenching. I do burnouts at 150F degree increment rises sitting at 250F for about 3 hours. Then i continue up to 800F: let it sit there for another couple hours. If i have other flasks that could go to a normal 1200F, i can ramp them up AFTER the cast in place lower temp flasks are out of the kiln. It’s very important to be ready to transfer the flask and get the molten metal into it quickly. I use a lucas centrifuge. The temperature loss because it’s 400F lower than conventional can cause other issues and problems of lif you take too much time in the transfer and casting itself. I suspect it’s cast in place particularly because of the surface and prongs. They look very naturally like the way a soft sheet green wax would behave. I don’t think the wax was “carved”, but rather “constructed” or built from sheet wax elements merged and melted smooth. Other gemstones sometimes work with casting info place - but the success is spotty. 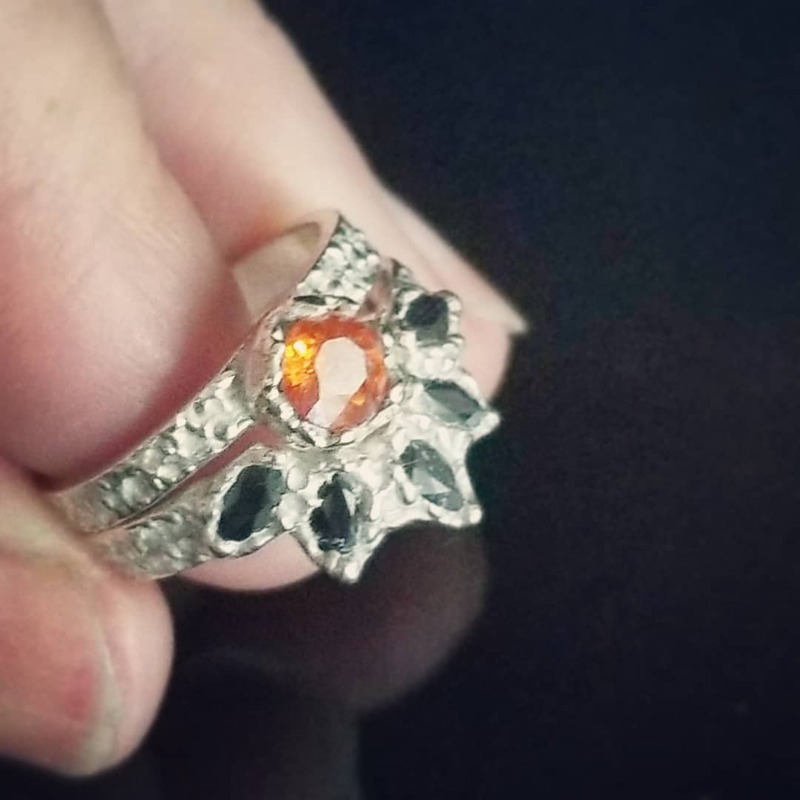 I did some orange sapphires and hessonite garnets. The garnets fared better. Some of the orange sapphires did survive though. Experiments, you never know what you’re going you get. Electro forming might work as well, but normally a conductive paint (generally copper) is used and sort of super plated to build up the metal. That process looks more globby to me. These are a recent medieval inspired design series I’ve been working on. They are sterling with vermeil details (pen plater), and the exterior ring surface from the investment was left in its oxidized state and not polished out. Everything else was carefully polished. The ring body was from a hand carved wax master to emulate a delicate hand peened hammer surface. I had an order for a another couple dozen of another ring that needed that band. I started experimenting with some of those waxes as a good set in place band. They took alot of time, but not anything near the conventional setting approach. Each band with 10 marquise stones has 2 carats total weight. As a result of the success I bought other gems to try - including natural black spinel 2×4 marquise. Last picture is where this series is going LOL: down the marquise cut gem rabbit hole. . . The large stone could have been set with those prongs though. You can carve a setting for the stone (or for a super organic-vibe, lightly heat it and press it into the wax to melt it in place. Then gently pry it off.). Then you add little globules to press over after casting, rather than cutting in a seat like traditional prongs. The edges look like there’s an indication of a bezel, plus the prongs, so combined it would hold it in place pretty well. I don’t think that it’s likely that the ring pictured is electro formed. Electro formed jewelry is too fragile for every day wear on a hand. The smaller stones were probably cast in place. Setting the Center wouldn’t be all that hard. 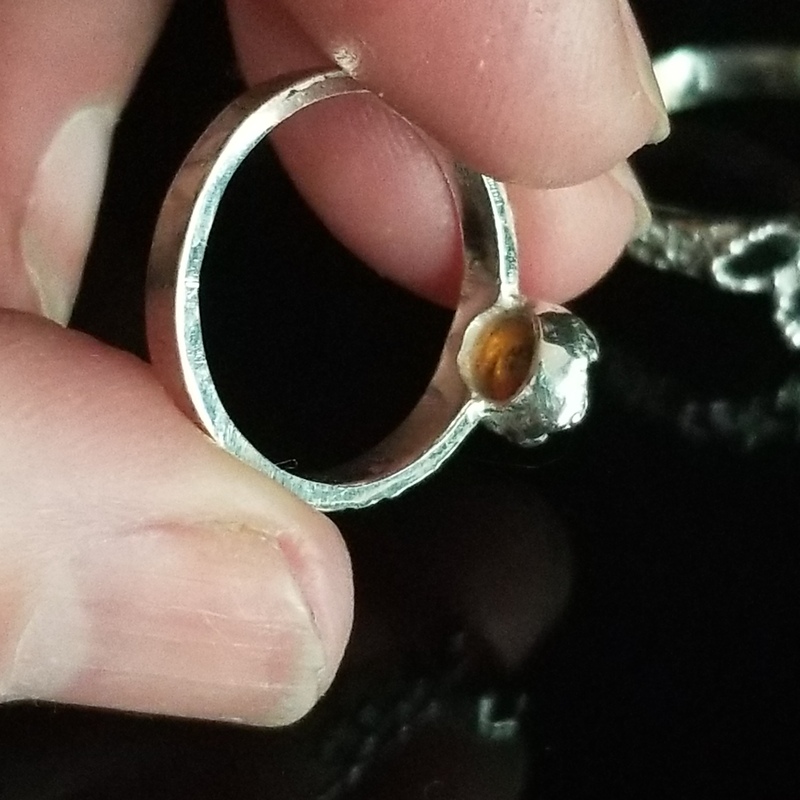 When ever I make a piece that has a rustic or modern primitive look I always make sure that the interior and edges of a ring, or the back and sides of a pendant or earrings are perfectly and crisply finished. I want folks to understand that my rough work was an artistic gesture. I was thinking the same thing about durability of electroforming. That center stone probably wouldn’t survive very long. Thank you all for your feedback and input. It gives me a starting place. Thanks Eileen for the extensive feedback, very helpful. I can see what you are talking about. Now, I just need to find some rough diamonds. I agree with those who believe this ring was constructed by what I tell my students is using a “wax build-up” method. There are several ways to do this which are probably known and used by many on this list. One low tech method is to use an alcohol lamp and an craft knife to heat small amounts of wax at a time on the blade of the knife in the flame of the lamp and then apply it to a ring mandrel (if you are making a ring) that has a piece of wax paper or something similar covering it. The basic wax model is constructed a little at a time and in the design desired until it is thick enough to add the stones and build the settings. 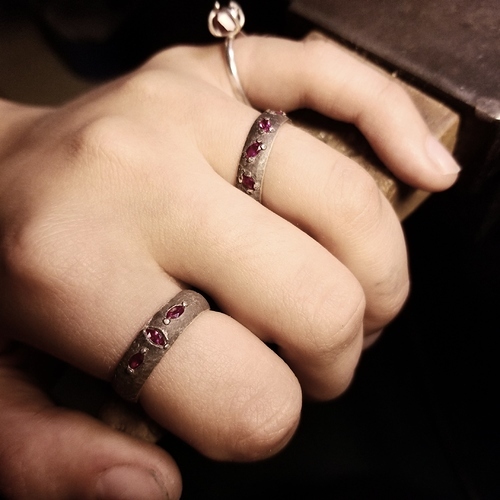 Once the model is made the stones can be gently removed for casting and set after if you are concerned about the viability of the stones surviving the heat of casting them in place. I have used injection wax when working this way because of the extra elasticity injection wax offers as well as the “memory” characteristic this type of wax possesses which allows for easier removal of the stones without distorting the settings. All the best trying one or all of these methods. Thanks for the input. This concept is becoming clearer. This is one dam*ned great idea. The process of “adding wax, in increments”, onto the existing form, one touch at a time, really IS THE ONLY ANSWER! There isn’t another process so darned easy. By adding wax anywhere, you can use this for all kinds of ‘unusual patterns’. BTW, you can even use “Parchment Paper” that’s used for cooking, is good as well on the mandrel as a quick release process! So many thanks “Mike Campbell” preparing the center piece for the larger stone, and prepare the bearings for those stones; then remove them just before the casting. Your job is 90% finished. Mike Campbell, I might suggest making this into a YouTube video! Your search for that process answers got me started. Recent piece for your enjoyment. Ring set with 5 5×2.5 black marquise sapphires cast in place with a 1 carat hessonite garnet set after it was cast. Fabricated from sheet wax and a heated sharp tool. It was easy to build up the organic texture suitable for the organic style and a decent setting. I am new to casting, so I need to clarify. 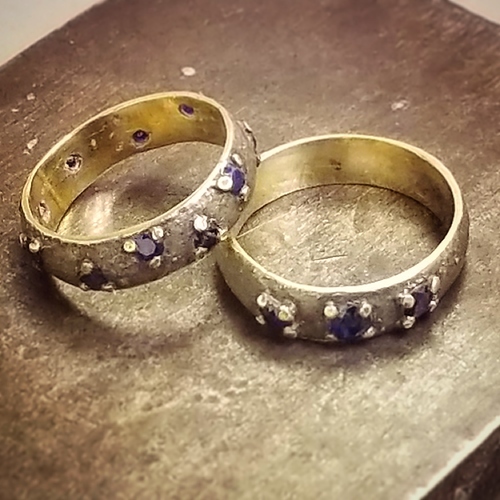 Were the sapphires placed in the wax and then invested and cast? Yes. Flask temperature was limited to 800F . Long burnout with a slow ramp speed. I use a centrifugal casting machine. I used supplementary sprue design using wire wax to ensure the metal world flow adequately. The gems act as a heat sink, cooling the metal prematurely. The 800F protects the gems from frying. But the difference in temperature between the 1200F normal flask temperature info the burnouts kiln down to 800 & the dramatic lower temperature from the molten metal comdition … you need to plan around it. I just did a test of various gems to cast in place. Quite successful IMHO. only the herkimer quartz crystal and a small emerald bit it. The emerald still had a cast of dark green to it, but it was no longer it’s verdant self. Generally, stones that work well are red (ruby), blue (sapphire) & white (diamonds, zircons, CZ). Other stones you should test personally. Thank you very much Elleen. I have so much to learn. Hi, Thanks for the info and feedback.